Everyone loves pie, right? Today is March 14 or 3.14, so it’s officially Pi (Pie) day! Let’s all celebrate with a slab of your favorite. My first choice is coconut cream with whipped cream, not meringue, topping. The best restaurant version that I have ever eaten is at Jim ‘n Nicks BBQ. Everything there is great, and the pie is amazing. The only problem is that you are usually too stuffed to order pie. My suggestion is order it to-go, and enjoy it later at home, once you emerge from the BBQ coma. My next favorite has to be pumpkin. Anything pumpkin is awesome, and pie is the best. Since it is only a seasonal favorite, it becomes more special. Third place has to be Strawberry Rhubarb. At little tart, and a little sweet, plus a small scoop of vanilla ice cream and you have the taste of summer on a plate. My go-to recipe source for all pies has to be myrecipes.com. The test kitchens are very particular and the bakers make everything with a personal touch. All of the recipes are high-scoring winners. As for pie spin-offs, I must admit that I love, love whoopie pies. They come in all flavors now, from red velvet to lemon. The best still has to be chocolate with marshmallow creme filling. They are worth the effort. the only problem is they get eaten so fast. Before setting out the platter, hide a few for yourself…. here’s a recipe The only addition I’d make is to substitute 1/4 cup coffee in place of 1/4 water to make the cakes a bit richer. So go ahead, celebrate this special day with dessert! 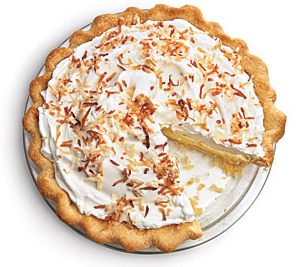 Posted in baking, Childhood memories, coconut. Bookmark the permalink. Love Love Love International Pi day…there was a time, not so long ago, when my mother and law and I would bake sweet pies and savory pies – about 14 different kinds – and invite friends over to celebrate the beauty of 3.14, and there was miraculously enough always enough pie so that one could have a sliver of several kinds. Pumpkin really is my favorite, yet at times Raspberry, chocolate cream, and banana cream will also do quite well. Think I’ll defrost some Pillsbury crust and get baking…. I wish I was there to have a pie fest with your family!